Michael Jackson’s death and all the discussion about his service arrangements put this stop higher on my list than it was. Old cemeteries have always been interesting to me. For me, the older a cemetery is, the more interesting it becomes. The cemetery in Boston Common is really cool because of the names in it and the same is true at Hollywood Forever. The kids and I picked up my friend Chris AKA “Creepy Otto” because well if you are headed to a cemetery and have a friend name Creepy Otto willing to go you have to take him. 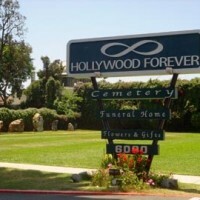 Hollywood Forever is on Santa Monica Blvd. in the heart of old Hollywood. 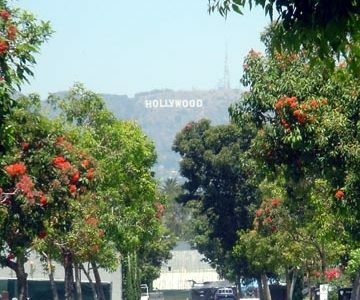 In fact the first thing you notice after you enter is the entire back perimeter of the grounds is Paramount Studios. 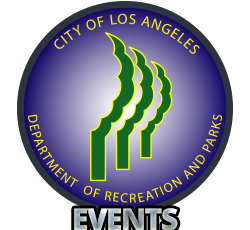 This is because the original of the cemetery was Hollywood Memorial Park. 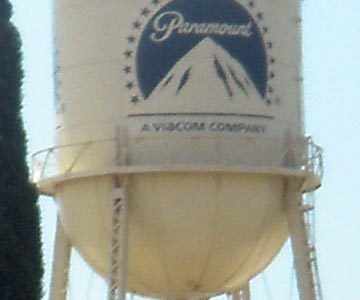 Half of the old cemetery was sold and Paramount studios was built on it. 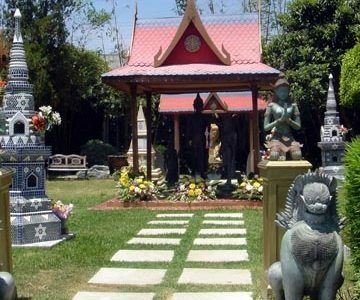 More Celebrities Buried Here Than Anywhere Else on Earth! Today we hit some of our perennial favorites. 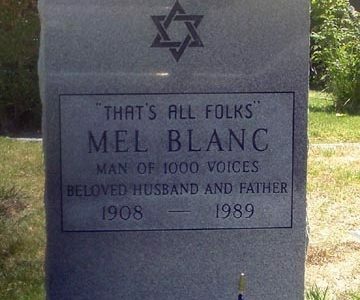 My daughter wanted to see Mel Blanc because she knows he did the voice for Bugs Bunny. I have an original cell from the Bugs Bunny cartoons on my bedroom wall so she gets a connection. Visitors always place rocks on top of his headstone to show that they visited the grave. 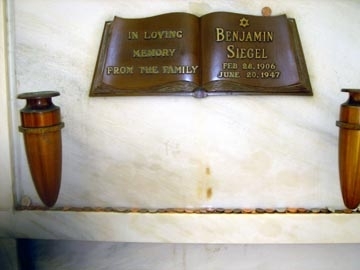 Next up is my favorite plaque which is for Bugsy Segal. Hey I guess it was a very Bugsy Day. I love the words “From The Family” on his crypt. People leave money on his marker for luck. We asked a groundskeeper whose grave is the most asked about or visited and the answer was Rudolph Valentino. This made me curious. Being a silent film star, I assumed our society in general would have forgotten him long ago because so many Americans can name our more than one founding father. So to see what made Valentino so intriguing, I did some Internet research. It seems he was the star of stars in his day and 80,000 people watched his body be transported to the cemetery and roses were dropped from a plane. Soon many copycats appeared and sometime more than one lady could be seen visiting his grave at the same time. Many credit Anna Maria De Carrascosa as the original Lady in Black and her grave is also located in the cemetery. She stopped dressing for her visits because the story was overshadowing her simple desire to revere and remember her friend but the imposters continued to show up. Rumor has it her daughter took over being The Lady In Black role and came as late as 1985. 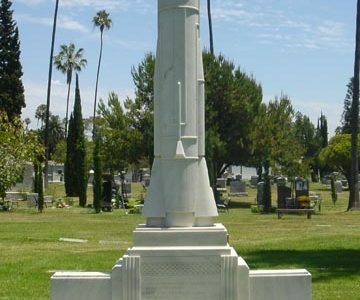 The whole story is still a mystery, very interesting and my reasoning behind why a grave of even a huge star from silent films would get so much attention. Cemeteries also allow you to put some detective skills to the test. If you pay close attention you will see the oldest graves are Jewish and it must have been a Jewish Cemetery to begin with. You can do research and find something new and interesting to look for with every visit. Today we went to the memorial for Bigsby because it is shaped like a rocket. He apparently had a lot to do with the success of our space and rocket technology and now I will research him. Another fascinating story I learned since my last visit is about Hattie McDaniel. 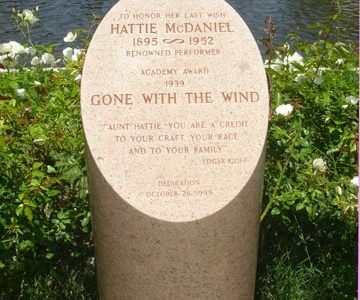 She was the actress who won an Oscar for her role as Scarlet O’Hara’s maid in “Gone With The Wind” Her wish was to be buried here but the original owners wouldn’t allow it because she was black. 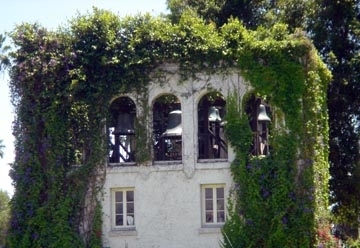 The recent owners heard this story and reached out to her descendants and offered to have her moved and placed where she originally wished at the expense of Hollywood Forever. After the family declined there was a memorial erected in her honor on the grounds. 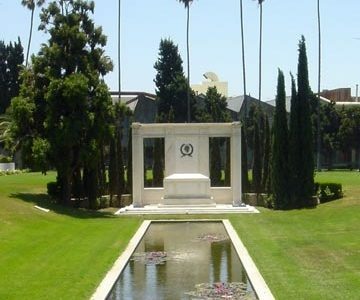 The most impressive grave belongs to Douglas Fairbanks and Douglas Fairbanks Jr. with its stone steps, reflecting pool and marble tomb. The list of celebrities is very long and you can buy a map at the visitors office. Of course the web has grave finding websites if you want to do research on the cheap. On our way to the Buddhist section I almost ran over a peacock which is an oddity in LA. I stopped to snap a picture and found they have a couple small hutches where in one they have eggs and the other has recently hatched chicks. If you stop to notice you will see a lot of original furniture, hardware and décor. Even a very old hearse. 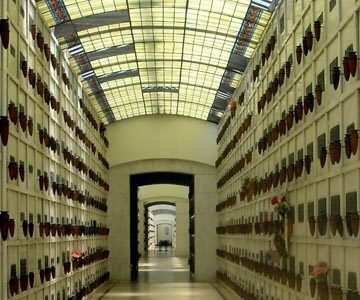 Hollywood Forever is also the place to be in LA on La Dia De LosMuertes or day of the dead. There are small parties and candles, gifts and offerings made all night. Even the next day is interesting because many candles are still lit, flowers are everywhere and the little memorials with figurines are really cool. The cemetery also plays outdoor movies on the wall of one of their mausoleums near the back. People bring blankets and wine, stretch out on the lawn on the warm Summer evening and enjoy the atmosphere. Pretty cool for a cemetery eh? I want to be buried here because for a cemetery it can get very lively.